When the days are warm, light and healthy salads are perfect for lunch or as a light dinner side dish. This Garbanzo Bean (Chickpea) Salad is a favorite because it is easy to prepare and provides a good source of protein, fiber and minerals. It also includes healthy and delicious vegetables. Combine all ingredients. Chill in the refrigerator for about 2 hours. Quick Tip: Use scissors to quickly chop spring onions and fresh basil to save time and effort. 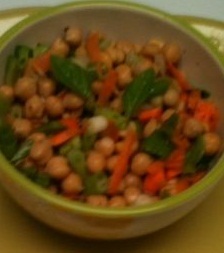 Return to Recipes from Garbanzo Bean Salad Recipe.